SERPed.net comes with a module called 'Rank Tracking', which contains cutting-edge rank tracking tools to cover any circumstance. We understand that rank tracking is not a 'one shoe fits all' requirement, so with this in mind, we built the most powerful and flexible tracking tools on the market. These tools allow you to track local rankings (by city or zip) for multiple locations, or Country rankings (where your site ranks in different countries). This updates as often as you choose it to. We have also created a manual-checking tool that allows you to get rankings for any URL or site, fast. You will be notified when the results are ready so you can always know exactly where your, and your competitors' sites stand. 'Rank Tracker' provides you with detailed tables and historical graphs so you can see where the pages rank in the search engines for the keywords of your choice and how their rankings evolve over time. 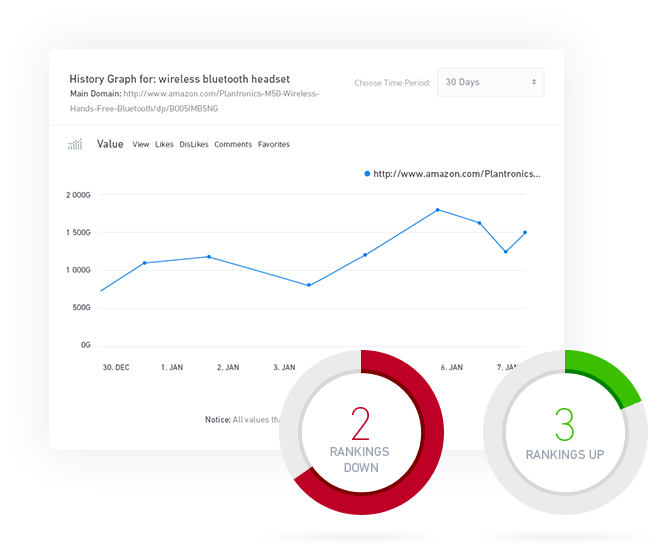 This tool is priceless, because it also lets you track the rankings of your competitors alongside your rankings, so you can easily compare and see your progress against theirs. 'Rank Tracker' also provides you with statistics about your links and social signals (Facebook, Twitter and Google+). It's one of the best, if not the best, rank tracking tool on the Internet. Seriously... It's super easy to use, it allows you maximum flexibility, and you can even receive email reports each update. We know that this tool is so good it should be a standalone with a high monthly fee, but in our endeavour to provide the ultimate suite of tools to manage your full SEO business, we simply had to dedicate a lot of resources to building the best rank tracking solution online!